Venezia Arte’s cultural initiatives have often been organised in association with various public or private bodies. The most important collaborations include Venice City Council’s Sustainable Tourism Office campaign to promote slow and sustainable tourism. Since 2012 Venezia Arte has worked with the Peggy Guggenheim Collection in Venice, offering free guided tours in the winter months. 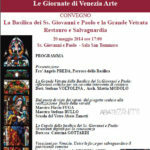 In May 2014 Venezia Arte began a series of fundraising activities aimed at the safeguarding and restoration of the Stained Glass Window of the Basilica dei Santi Giovanni e Paolo. In 2015 Venezia Arte organised an important event dedicated to the Scuole Grandi and confraternities in Venice, institutions which hold an extremely important place in the city’s heritage, in that they are “living heritage”: Scuole Grandi, Scuole Piccole and Confraternities: art, society and devotion during the Venetian Republic – Itineraries between Past and Present. The event was organised together with the Coordinamento delle Scuole Grandi/Arciconfraternite di Venezia – or rather, the Scuole Grandi of San Rocco, Carmini, San Giovanni Evangelista and San Teodoro, and the Scuola Dalmata dei SS Giorgio e Trifone – ULSS 12 Veneziana, which manages the Scuola Grande di San Marco, restored to its original splendour, l’Arciconfraternita di San Cristoforo e della Misericordia, and Chorus-Associazione per le Chiese del Patriarcato di Venezia. 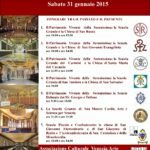 Since 2014 Venezia Arte has participated in Art Night together with the Dominican Priests, offering guided tours of the Basilica dei Santi Giovanni e Paolo. 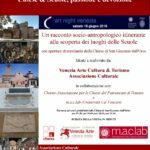 For Art Night 2016 Venezia Arte organised a second programme in tandem with Chorus – Associazione per le Chiese del Patriarcato di Venezia and the Management of the Arts and Culture Laboratory (m.a.c. lab) run by Ca’ Foscari University entitled An Itinerant Socio-anthropological Tale about the Scuole.